We've spent a lot of time talking about what will happen to our T-Mobile contracts, and the overall U.S. wireless market when the AT&T/T-Mobile deal is approved. But we've neglected to talk about what happens to the thousands of T-Mobile retailers and their employees. Apparently, many independent T-Mobile retailers are already throwing in the towel in anticipation of the acquisition. One such retailer is Kirk Brundage, who owned 8 T-Mobile locations in Idaho and Utah. After he heard about the deal, he decided to sell his locations to an unnamed competitor, rather than wait for the hammer to drop. Brundage explains that there was "little hope for a dealer of [his] size". This sentiment is rightly shared by many T-Mobile retail owners. AT&T has already promised to 'rationalize' their retail chains in order to make the acquisition more efficient. Combined, the two carriers have 9,200 retail locations, and given the waning performance of physical retail locations, that's way too many. 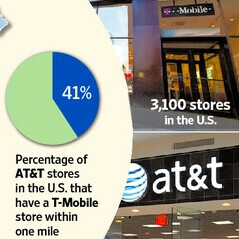 Forty-one percent of AT&T stores are within one mile of a T-Mobile store. And those T-Mobile stores will probably be seen as redundant. Even if retailers aren't cutting stores, they are at least shelving their expansion plans for the time being. Unfortunately, those retailers aren't allowed to discuss retail plans with AT&T, while the deal is still being reviewed. That adds particular uncertainty to the smaller retail owners, that will likely be overlooked by the Ma Bell giant. this is a s**t sandwich no matter how you slice it! big company after big company gobbling up smaller ones. apple seeking patents to crush out competition and innovation so it can remain the dominate player. its all companies. sending jobs overseas, and expecting us to support them back home! pure evil. what will happen when we finally make wages on par with china? when we can no longer afford to buy the foreign made goods that these evil behemoths try to sell us? when we no longer innovate, and just graze on the land and food that they give us! boy i am scared! sheesh! Another example of why I prefer phones with physical keyboards. I'm being kind in attributing the form of your comment to the lack of a keyboard, rather than a lack of knowledge in spelling and grammar. Dominant is the word you wanted. The contraction for "it is" is written "it's" with an apostrophe. The word is "companies" - no "y". No one is making you buy their products. But perhaps you should comment from a PC with a spelling and grammar checker. Well well well...i work at t-mobile and dey announced tht we were closing in less than a month at the meridian, ms location along with one of the stores in jackson, ms, and, one of the stores in Louisiana. Soooooo....coincidence or no? This is great now att and tmobile have more customers which means cheaper deals Why u guys complaining?? ATT and VZW are already the biggest carriers by far. A bigger company does not mean a cheaper deal. They actually have LESS incentive to give you a great deal because there is less choices for you out there. When the most expencive carrier with the worst customer service buys the cheapest carrier with award winning service, thats only going to be a net "bad" for the industry, no matter how much ATT says they will improve. Just wanted to point out in the article, Tmobile stores wont be the only ones shut down. ATT will shut down their stores as well. Why? Its going to come down to which one of those stores that are near eachother are in a prime location. If the Tmo store is in a better spot (or is bigger) it will probably be the one to stay and vice versa. Employees from both companies will be losing jobs in droves as they start shrinking out the work force. More T-mobile than ATT. ATT is union. Then, of course, management is fair game. I hope this is saracsm! If not you are completely delusional! Take a look at the industry for a moment. For one it is arguably the most overpriced commodity with 3 and a half national players. The companies with the most share of the market today do not offer the best deals. The competition is already minimal at best, price is all within reach of eachother and I am still wondering if you are serious how on god's green earth you can support that comment. You must not be able to distinguish between the political parties. It is the Republicans who are sucking up to big business, such as the oil companies. And I'm reporting you again for that picture. if thats true then why do more democrats get more money from big businesses than republicans do? Obama is trying to raise a billion dollars for reelection. 95% of that is to come from big businesses like GE and Apple who gain from his liberal policies. You should listen less to politicians and actually pay attention to what they do. Oh...but this merger will CREATE jobs. At least that was what AT&T said. Of course, AT&T is great at lying, not only to their customers, but to damn near everyone. I've been on the end of one of these "corporate buyouts" before with another retailer, and I will tell you from personal experience, nothing good ever becomes of it. It was a similar deal where the buyout was done to eliminate the competition. I saw store after store close in markets where the buyer had locations. What stores weren't rebranded were closed, even in markets where the buyer had no locations. To this day, out of the 150 locations the company had before it was bought, only three original locations remain. So, no, this is never a good thing. Some venture capitalist group should buy T-Mobile, not AT&T. It's too bad the backdoor government we have will take large amounts of lobbyist money under the table to make this deal go through. Scarface said it best... "You know what capitalism is? Get f**ked." So he basically thinks he can't compete with other independent AT&T dealers. Clearly he didn't know how to hang onto this customers. If he knew how to keep his customers his business would only have grown. Independent dealers can make mint, even in competitive markets, it comes down to customer retention and marketing that brings in new customers. If a dealer has a focus onCustomer Culture, then the dealer's going to make money. Is this how ATnT intends to create more jobs, like they said in their FCC filing? I smell BS. LMAOOO! Imagine a world where Microsoft buys Tmobile and lets it run it's self. They make them the national carrier for all things Nokia and all things Windows 8. Tmo still carriers everything they carry now but they would be the only national retailer with the new Nokia phones and they would get the updates like Mango and Apollo first. They could push Xbox, Kinect, Windows Phone, Windows 8 tablets and still carry Blackberry and Android models. That FCC would approve it. Stores would stay open. AT&T would have to spend billions on their own network and Sprint would be OK. I really think that once LightSquared comes online it's going to be a fantastic option. I heard that ATT is bribing Tmobile employees with retention bonuses so that they don't bad mouth the deal. Heard it from a Tobile store employee. When the deal goes thru he will get a $10,000 bonus.